If you wish to hire a UNCW student for a Federal Work Study position in your department or organization and would like to post this open position in Handshake, watch the step-by-step video or follow the instructions below. Login at uncw.joinhandshake.com/login and enter in your username and password you created. Select a Job Function for this job. If none are applicable, select “Other”. Add the pay rate per hour. The Job Location should be the University Address: 601 South College Road. Select all required documents for this position. Leave the graduation dates blank since the position is for current students. Select which School Years you would like to hire. 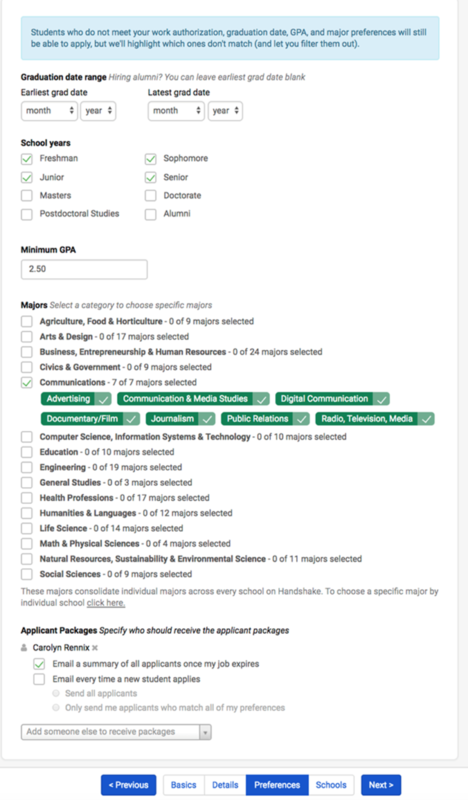 Select the Majors you would like to hire. Check each box if you are not looking for a specific major and would like to hire across all majors. Select how you would like to receive update about applicants. Select “University of North Carolina Wilmington” on the list of schools on the left. Add the Apply Start Date and Expiration Date. The expiration date is the deadline for when students can apply, not when the position is over. This must be filled out in order to submit the job for approval. 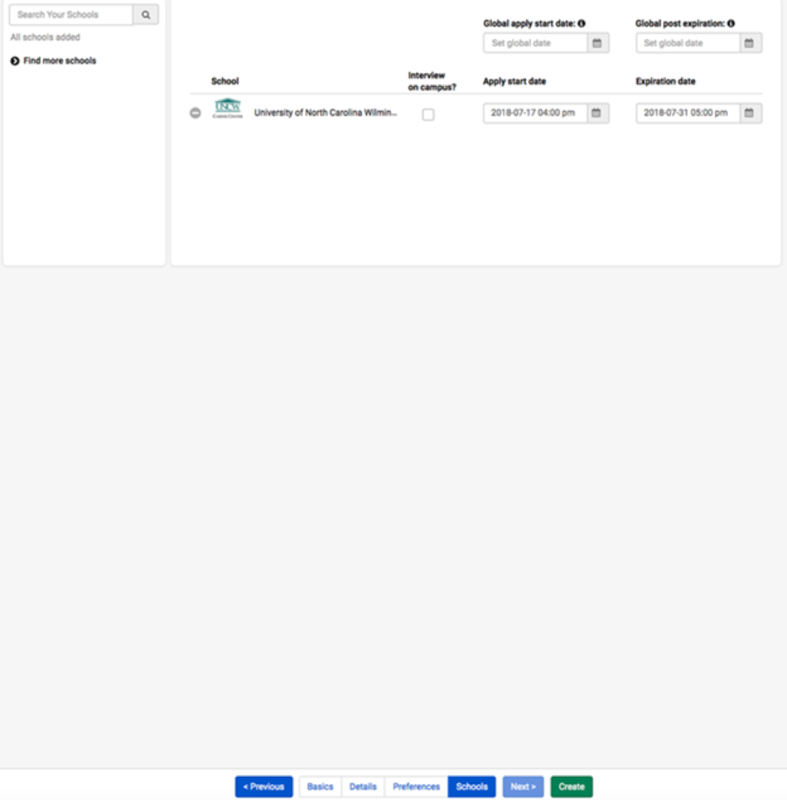 Click the green Create button on the bottom of the page. Now your job posting will need to be approved by our Job & Internship Specialist. Please allow at least 72 hours for your job to be approved. Moving forward, you can access Handshake by logging in at uncw.joinhandshake.com/login with your username and password. 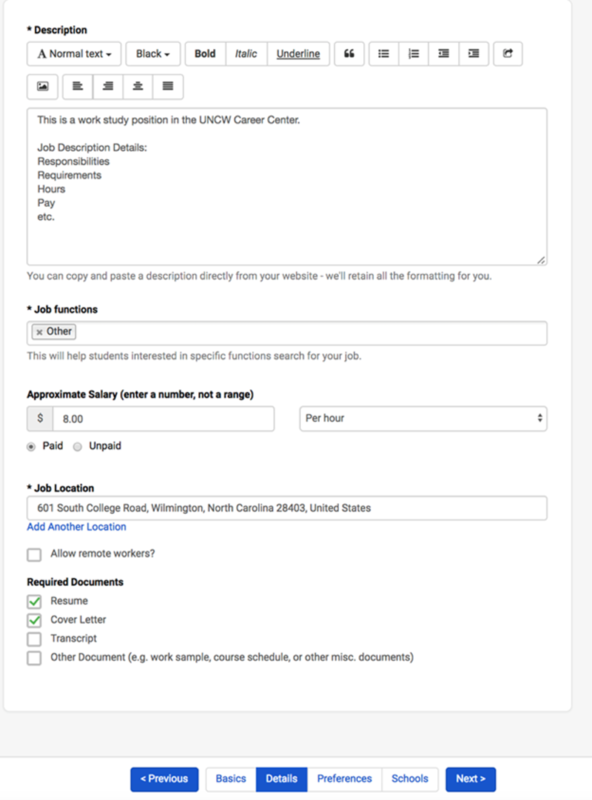 You must have a Company Page for your Department created and approved before posting a job. Create a User Account & Company Page here. Please allow at least 72 hours for your Federal Work Study Job Posting to be approved. 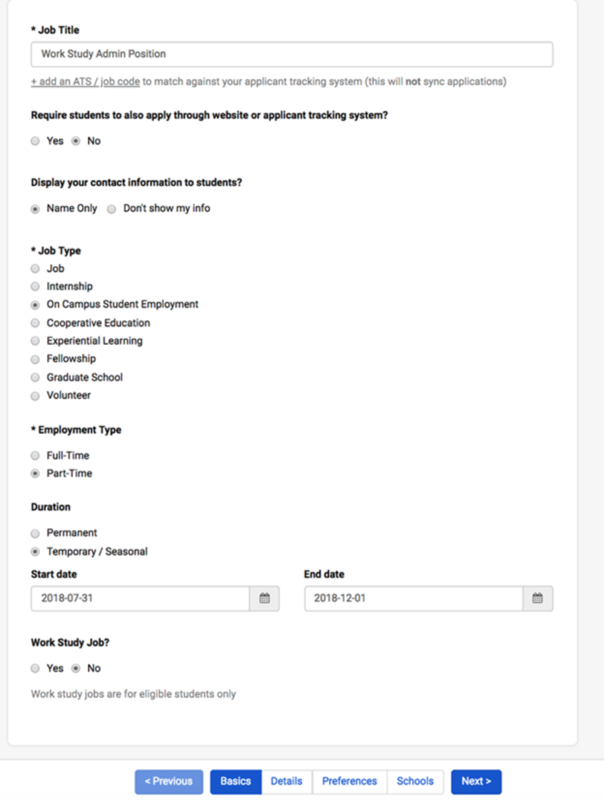 Once your job posting is approved, you can login to evaluate applications and monitor progress. Login to your account at uncw.joinhandshake.com/login with the username and password you created. Call our Job & Internship Specialist at 910-962-3079 with any questions.